The Fortuner petrol is a rare body-on-frame petrol SUV in India. Is it a worthy alternative to the diesel? Following in the footsteps of the Innova Crysta, the Toyota Fortuner has now been introduced with a petrol engine. Body-on-frame SUVs have always been diesel engine territory in India, due to the low-end torque and efficiency they offer. So how does the Fortuner petrol fare and is it a purchase worth considering? The Fortuner petrol uses the same 2.7-litre, naturally-aspirated petrol engine as the Innova Crysta. It’s offered in the same state of tune as well, so available at the press of your pedal is 166PS of power and 245Nm of torque. However, let’s talk refinement first. Swap seats from the diesel and the first thing you notice is how much smoother the petrol is in comparison. It’s inaudible at idle and sounds polished even once you get moving. It’s not as sophisticated as Honda’s i-VTEC engines, but get a little hard on the pedal and it’s actually quite pleasing to the ears. At 245Nm, the low-end torque isn’t much when you consider the Fortuner’s 2+ ton weight, and yet, it doesn’t feel underpowered. The motor is quite rev-happy, but set down to a 100kmph cruise, and you’ll see it purring below 2,000rpm – not a stark difference from the mile-munching diesel. That said, fuel-efficiency isn’t its forte and our tests saw the Fortuner deliver 8.68kmpl in the city and 9.26kmpl on the highway. Even with the petrol engine, the Fortuner retains its credentials as a tourer. The 6-speed automatic gearbox offers smooth shifts, but highway overtakes do command a downshift or two. It’s here that you notice the difference the diesel’s added torque makes, as the gearbox’s slow kickdown response is more pronounced. This reflected in our road tests, wherein the petrol Fortuner took 8.13 seconds to go from 20-80kmph, compared to the diesel’s 7.2 seconds. Its 0-100kmph time of 13.22 seconds is also 1.08 seconds slower than the diesel. Like in the diesel, you get the Eco and Power drive modes, but you don’t get the option of 4x4. Eco dulls down the throttle response, puts the air-con into a more conservative setting and makes the transmission upshift quicker. Power mode, like in the diesel, is ideal for zipping through truckers on twisty roads and makes the transmission hold onto gears for longer to keep the revs up. The dynamics package of the petrol Fortuner is no different than the diesel, even though it doesn’t get the latter’s pitch and bounce control stabilization system. It gets 17-inch wheels and thanks to the fatter sidewalls, the low-speed ride quality is marginally better, though both versions feel equally stable at high-speeds. The steering is light enough for city usage, which is good considering how this is an urban Fortuner. There’s great bite from the brakes too and nosedive under hard braking is managed better than it was in the old Fortuner. 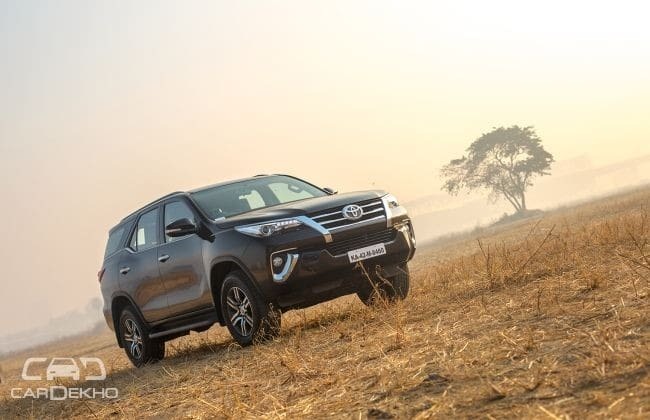 Road tests saw the Fortuner take 3.38 seconds to come from 100kmph to a dead stop in 43.88 metres and 2.71 seconds to pull off 80-0kmph in just over 27 metres. It’s not a petrolhead-pleasing setup, but it is engaging to drive, provided you understand one simple fact – yes, the Fortuner petrol isn’t an off-roader and is more city-centric, but it still isn’t car-like to drive like the CR-V or Tucson either because a tall-boy SUV can’t be as agile. It’d take a keen eye to tell the diesel and petrol Fortuners apart. Since there’s no badge to denote the fuel type, your only cue is the ‘petrol’ sticker pasted on the fuel filler cap - quite necessary since most fuel station attendants instinctively reach for the diesel nozzle. The rest of the package remains the same as the diesel, so you still get the edgy new styling that’s quite a break away from the outgoing generation’s old-school design. The feature package is nearly the same as the diesel’s too. Automatic climate control, the 7-inch touchscreen infotainment system, leather upholstery, smart-key and optitron instrument cluster are all included as standard. The only thing missed out on is downhill assist control (DAC) which is exclusive to the 4x4 variants of the Fortuner. We've explored the Fortuner's interior in detail in our Fortuner diesel review. Unlike the Fortuner diesel, buying the petrol version is quite a head over heart decision. It’s for the calculative buyer who wants the pride of owning a big SUV, without paying the extra money for a diesel engine. Additionally, with the recent anti-diesel rhetoric, this variant is the Fortuner’s fail-safe. That said, the 4x2 AT diesel Fortuner which costs around Rs 1.53 lakh more offers better value in the long run and is our pick given the choice.